So very easy and so very fast and even good the next day between two slices of crusty bread with mayo. It hits the mark on any meal time, any time of the day (or night). This one was dinner with a salad. Just add in whatever veggies you have that will compliment each other, toss in some goat cheese, and under the broiler for mere minutes! Make sure your oven rack is moved down one notch from the top. 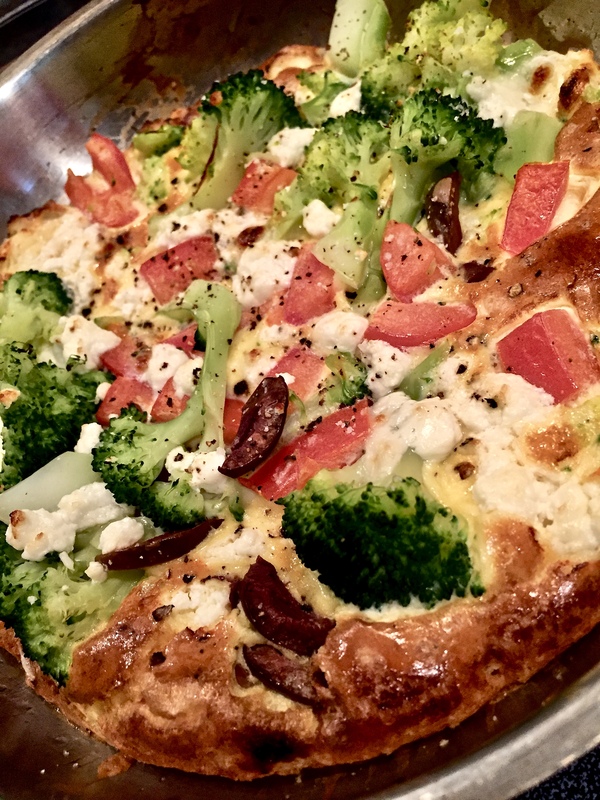 Blackened Frittata isn’t a thing. Preheat your broiler, have veggies and cheese at the ready. Mix the eggs and liquid together in a bowl and pour into the hot oiled skillet on the stove top as if making scrambled eggs. Using a rubber spatula gently pull the egg mixture from the outer edges in, a gentle scramble! Don’t cook all the way through, keep it loose, it’s going to cook further under the broiler. Add your choice of veg* and cheese toppings. Dot with cheese. *Broccoli should be par cooked ahead of time. Slide the skillet/ frittata under the hot broiler and watch as it puffs up in a few minutes. Watch closely! You can also put it in a 400′ oven increasing the cook time slightly. Cut in wedges or in half- however you like ~ Great with a fresh crisp salad.